Using conventional counting methods, samples with high or low cell densities require time consuming dilution or concentration steps. The variable height chamber of the CellDrop adjusts chamber depth automatically, delivering the most accurate counts over the widest cell densities – 7 x 102 to 2.5 x 107. Chamber height can also be adjusted to accommodate almost any cell with a diameter range of 4 to 400µm. Cell Size Histograms allow easy gating for non-target cells or cell debris. Simply drag the slider to set the cell size of interest. Viability measurements of PBMCs in the presence of debris and red blood cells. 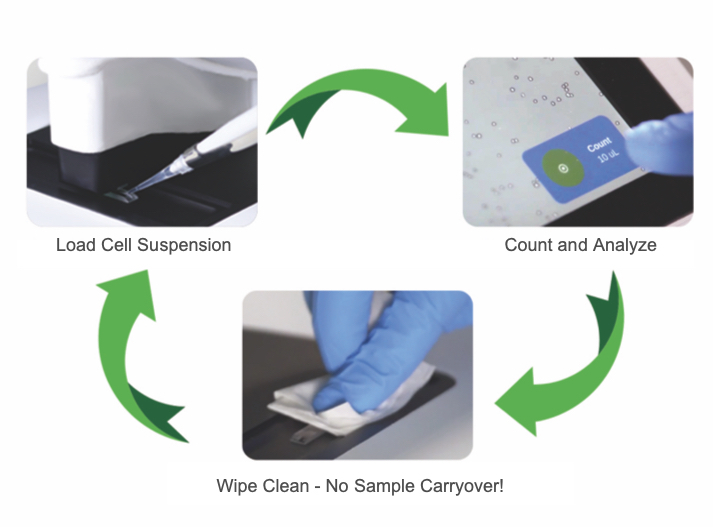 The unique combination of flexible hardware and custom software ensures compatibility with a broad range of cells and assays. Automatically calculate cells / ml and % viability along with a range of useful cell metrics. Add dilution calculations to your protocols to calculate volumes of cells and buffer required to meet target cell densities. Flexible reporting options allow easy exporting in a format to suit each lab member. Email results, print to a network printer, save to a network drive or USB. Data is also saved to a large in-built hard drive for extra data security.